Just like every other girl, I fully intend on making the most of sparkle and glitter this holiday season. 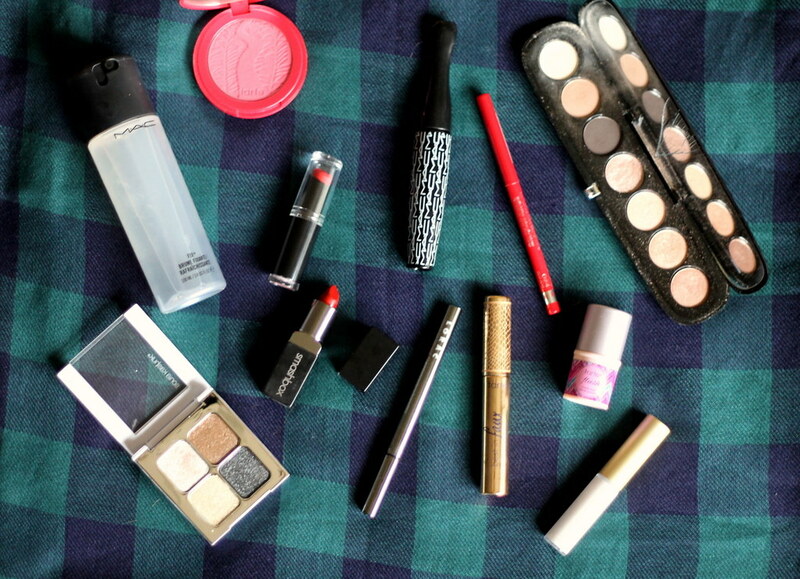 My makeup is no exception, and this year, I am all about a gold, sparkly eye and red lip. After the eyeshadow is done, grab your favorite liquid eyeliner (mine is Lorac’s Front of the Line Pro in black) and create a cat-eye. Then finish up with mascara. If you’re looking for your lashes to make an impact without going the falsie route, I really like Tarte’s Best in Faux Lash-Extending Fibers. For cheeks, I like to add a bit of color and red without going overboard (you don’t want to overpower that bold lip). My go-to’s are Tarte’s Amazonian Clay 12-Hour Blush in Natural Beauty and Tarte’s Cheek Stain in Flush. Then top off your cheekbones with a highlight, such as “pearl” from Becca’s Shimmering Skin Perfector Spotlights trio. Finally, and most importantly, it’s time to focus on that red lip. For long-lasting wear, using a lip liner is important. Rimmel’s Exaggerate Automatic Lip Liner is a good option. The Wet n Wild Megalast Lip Color in 909D Coral-ine is amazing for the drugstore-savvy gal, and for the girl who loves something high-end, I’d suggest Smashbox’s Be Legendary Lipstick in Infrared Matte (the perfect holiday red). What’s your go-to holiday makeup look? Let me know in the comments below!